Describing the scope of the book, the introduction discusses the contemporary importance that is attributed to the notion of victimhood in the context of human rights, transitional justice and the politics of memory. 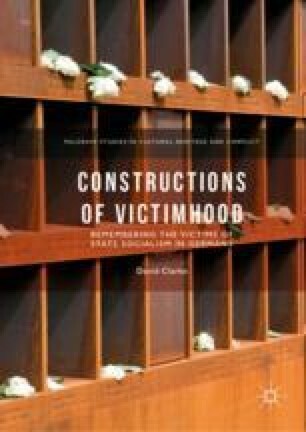 It describes the measures taken in post-unification Germany to address the abuses perpetrated by the state socialist regime during the Soviet occupation and in the German Democratic Republic, before considering the difficulty of defining victimhood in this context. Bundesregierung. 2013. “Bericht der Bundesregierung zum Stand der Aufarbeitung der SED-Diktatur.” http://www.bundesregierung.de/Content/DE/_Anlagen/BKM/2013-01-08-bericht-aufarbeitung-sed-diktatur.pdf?__blob=publicationFile. Accessed July 29, 2016.